Sweet & Tart, just like me (or so I’ve heard). In early summer, berries are plentiful at farmers markets and local grocery stores. The warm weather also has us yearning for refreshing cocktails. Can you guess where we got our inspiration for this salad/dessert recipe? That’s right — Mojitos! 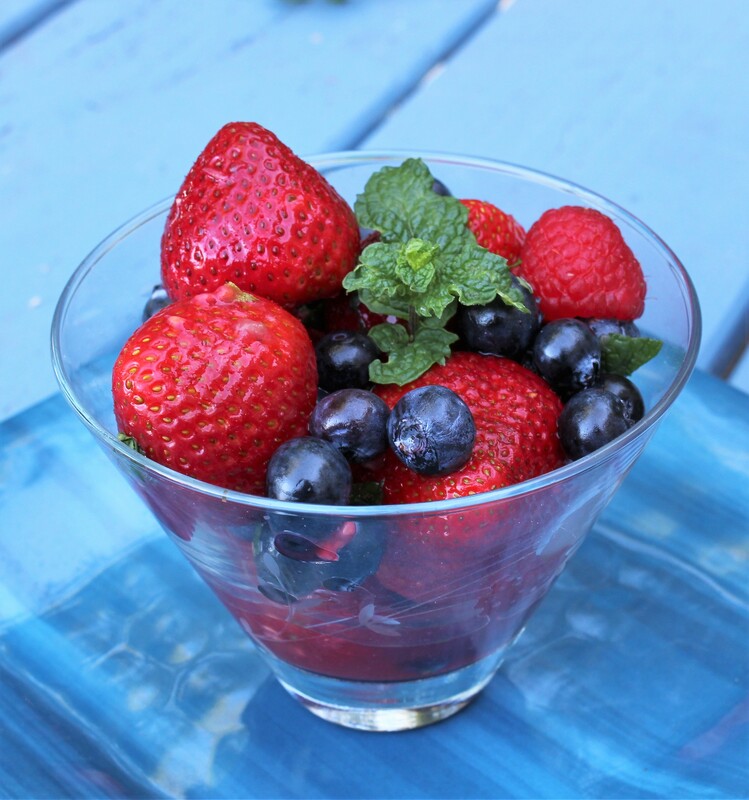 The Mojito-inspired Summer Berry Salad tastes sweet from the strawberries and blueberries with a tinge of tartness from the lime and balanced out nicely with the mint. Traditionally from Cuba, a mojito is a cocktail that consists of five ingredients: white rum, sugar (traditionally sugar cane juice), lime juice, soda water, and mint. Taking a cue from the mojito, I muddled the mint leaves in the lime juice to release the essential oils and chopped a few leaves and left small ones intact for garnish. It’s a perfect way to start or end a summer get together. This summer berry salad is so quick and easy to make your friends are going to love it. If you’re hosting an adults-only dinner party, I would add a bit of light rum in a heart beat! Why not?! It’s summertime people and the living is easy. In fact, leave the rum bottle on the table and allow people to make drinks with the berries. How wonderful would that taste, right? I have also thought the mojito berry mixture would be yummy in prosecco or another sparkling wine. In a colander, wash the berries and allow excess water to dry. In a small bowl, add the lime juice, Splenda, and mint leaves. Muddle to release the essential oils of the mint for about 30 seconds. In a medium-to-large bowl, add the washed berries and pour the lime juice mixture over the berries. Mix carefully to coat all of the berries with the lime juice. Be careful not to over stir as the raspberries are more delicate and can get mushy.